You may be able to tell that I have a bit of a sweet-tooth (for example, I love Brooklyn Black Chocolate Stout and I really enjoyed the Southern Tier Creme Brulee Stout, both uber-sweet beers). As such, Coca-Cola has long been one of my favorite beverages. However, I tend to drink too much of it, so every few years, I give up Coke for Lent. I find that the 40 day length of Lent makes for an ideal habit-breaker (Last year, I gave up television). Short enough that it's achievable, long enough to make you realize that you don't need to indulge in your habit quite so often. So this year, I'm giving up Coke again, which basically means that for the next 40 days or so, I'll most likely be filling the void of Coke with beer. Reflecting over the years as we approach our 15th anniversary here at Victory, we can't help but be struck by the realization that Downingtown has made a great home for Victory. From the enthusiastic throngs that crowd our brewpub to enjoy our creative, flavorful beers and cuisine to the natural charms of the area, we are blessed with good fortune. As the active community contributor we've been over those years, we recognize our opportunity to both utilize and protect these assets. Chief among those assets is the pure water we receive from the East Branch of the Brandywine Creek that begins its journey to us just under 14 miles from where we brew with it. We'll be celebrating this water (insert your lite beer joke here) with our anniversary beer, Headwaters Pale Ale, due to be released February 15, 2011. Beer Nerd Details: 5.1% ABV bottled (12 oz). Drank out of a pint glass. 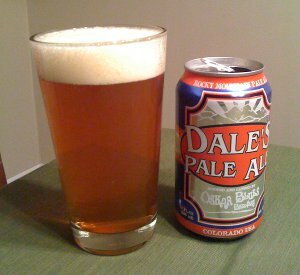 Oskar Blues Dale's Pale Ale - Apparently the first modern craft-beer to be produced in cans, this beer has lead the way to several other canned craft beers, though they're still somewhat rare. In the beginning, brewer Dale Katechis hand canned the beers (one at a time! Uphill! In the snow!) and sold them as a way to promote his restaurant, Oskar Blues Grill and Brew. They encountered some skepticism from beer nerds, but they eventually came around and now Oskar Blues is one of the big Craft Beer success stories. Cans actually do have some advantages, namely minimizing exposure to light (brown bottles protect, but not completely) and oxygen (unwanted light and/or oxygen can produce off flavors in beer, leading to "skunky" beers). Cans are also cheaper and take up less space. Modern can linings are also supposed to be better at not impacting the taste of the beer itself (something older cans may have suffered from). I bought a six pack of this a while back (and drank a few during my Oscars Liveblogging adventure) and have been enjoying them for a while. It pours a bit of a darker, light brownish color. I wouldn't call it hazy, but it's not as clear as the Headwaters. Smell is a bit less complex, but also a little stronger. Earthy hops, all the way. 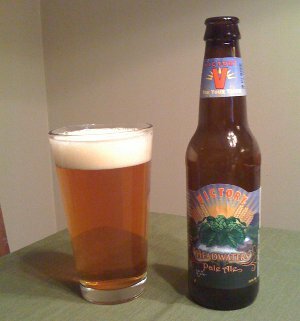 Taste is definitely sweeter and maybe even a bit less hoppy, but still complex and flavorful. It has a fuller body, but is still quite drinkable. I'm having a hard time comparing these two beers. They're both excellent for what they are and though they're both distinct, their strengths and weaknesses seem to balance out. So I'll give this one a B+ as well. Beer Nerd Details: 6.5% ABV canned (12 oz). Drank out of a pint glass. I must admit, sometimes all I want is a good, crisp, simple beer, particularly in the summertime. Last summer was the quest to find Kolsch, which was actually successful I think twice...Goose Island makes a Kolsch, and somebody else. The Victory sounds quite drinkable, I wonder if it will make its way up here..? I can usually find their stuff, though the last I had from them was a sixpack of the Prima Pils that had been sitting on a shelf for at least a year. I don't think I've ever had a Kolsch that I'd say I loved, but I'm certainly not an expert on the style (I've apparently only had one since the blog started, and that was an unimpressive Flying Dog effort). I don't think I've ever had any Goose Island beers though, so I'd certainly welcome it. This page contains a single entry by Mark published on March 12, 2011 6:00 PM. Beer Club: The Ales of March was the previous entry in this blog. Style and Stone Sublimely Self-Righteous Ale is the next entry in this blog.